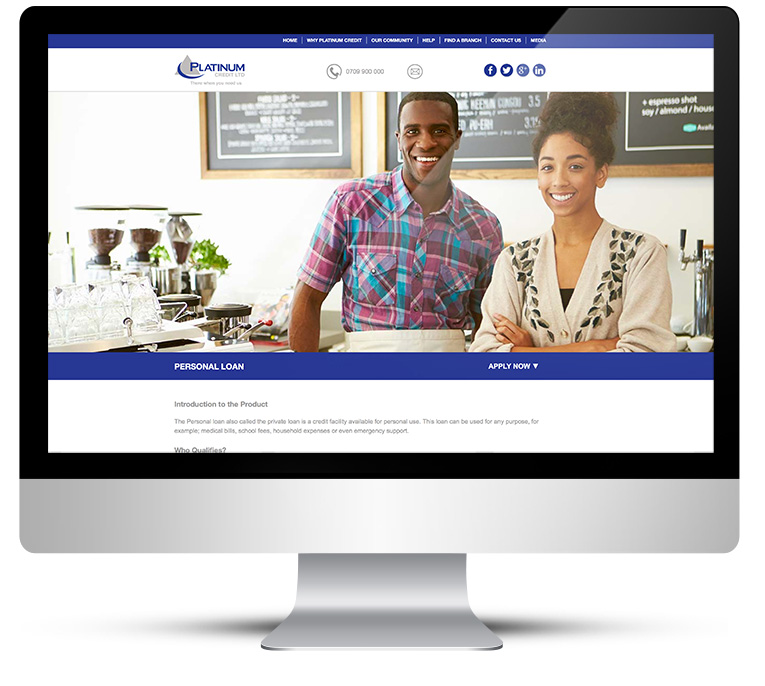 Corporate web design with WordPress for a finance company with Google maps, apply online and CSR news. 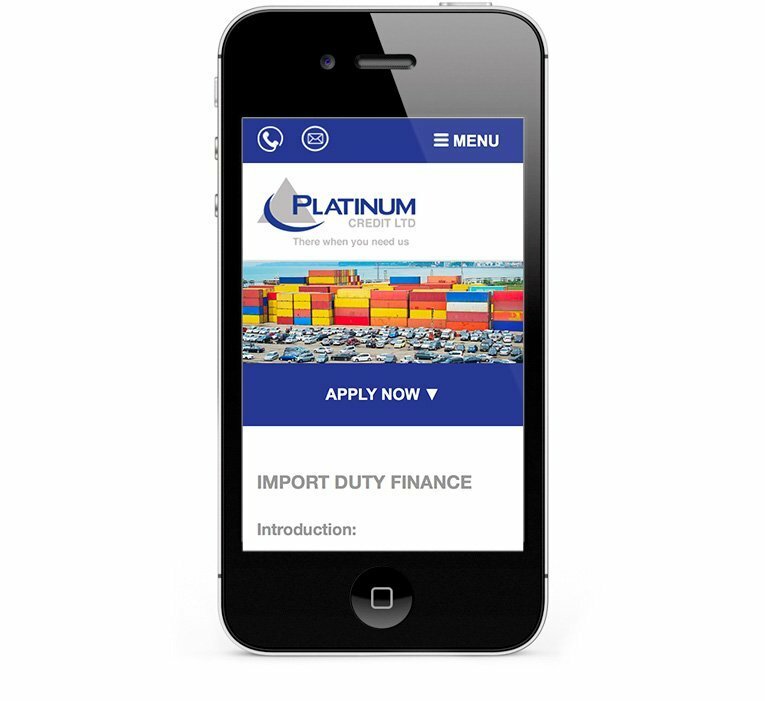 Platinum Credit Limited is a micro-finance company. They employ in excess of 1,000 staff serving 80,000 clients. 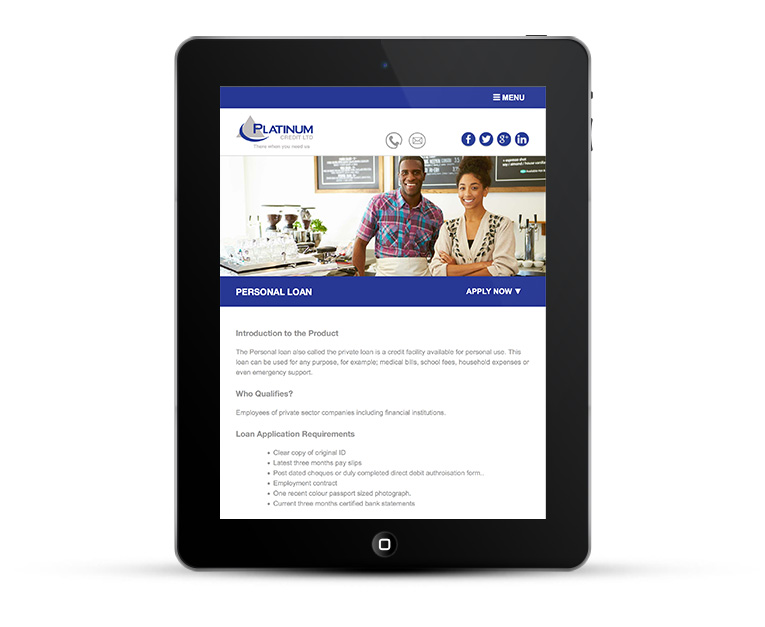 Platinum needed a new corporate web design as most of their clients access the site via mobile devices and they needed a website that worked well and looked good everywhere. 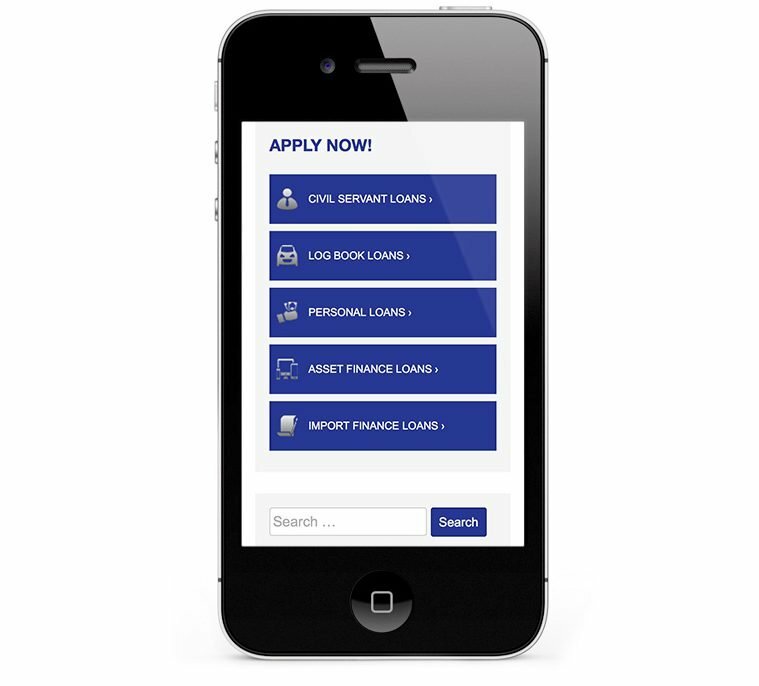 It was vital for clients to be able to apply online. They also needed their clients to be able to find their closest branch and get directions to visit. They received a lot of phone calls from customers asking the same kind of questions, so wanted to answer these online. Their existing site was not editable and had many errors and broken links, it was not SEO friendly. 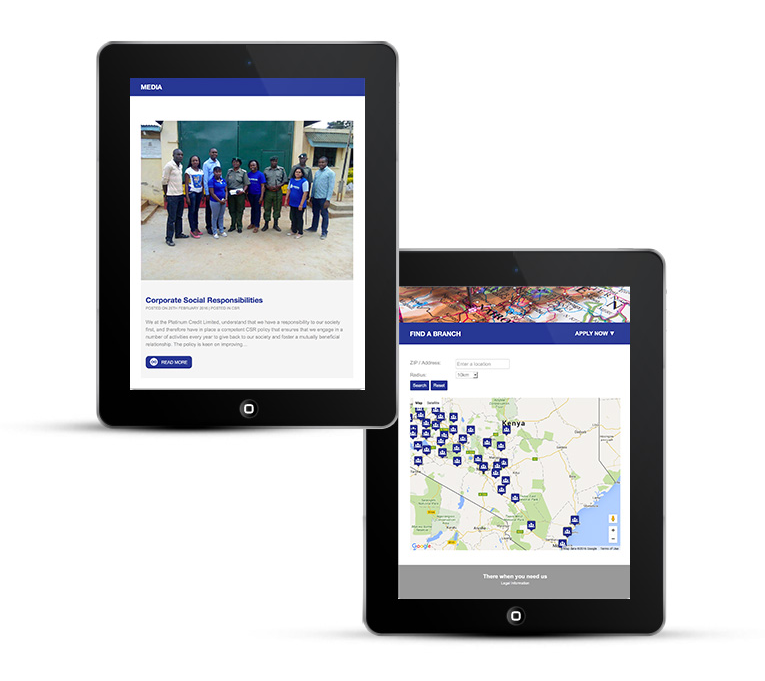 This is a fully mobile responsive website design that enables the client to quickly get to what they need. The site follows Platinum Credit’s strict brand guidelines for colours and fonts.  The focus was on mobile access for this site, it is quick to load and easy to follow menus allow customers to get to what they want quickly. 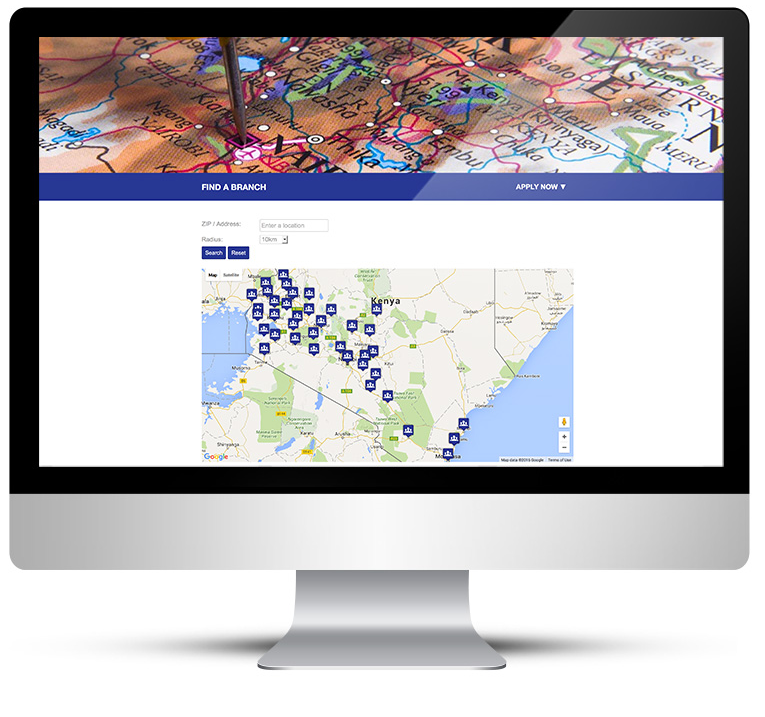 A custom WordPress design with interactive maps to allow visitors to find the nearest branch to their location. A comprehensive FAQs section helps people online easing pressure on the call centre, they can apply for finance direct from their phone. Clients can view testimonials from others and add their own feedback directly to the website, naturally all submissions are moderated by Platinum Credit staff via the WordPress admin. Candidates can view job vacancies and apply for jobs via the careers page. The new site is completely Google friendly and performance has improved since it was implemented. 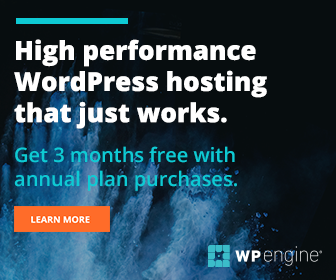 Content is entirely manageable through the WordPress platform. The website is optimised for all search engines including Google. The regularly updated blog helps search engine rankings as content is shared and distributed via several social media platforms, all linking back to the website. WordPress design for easy management and editing.